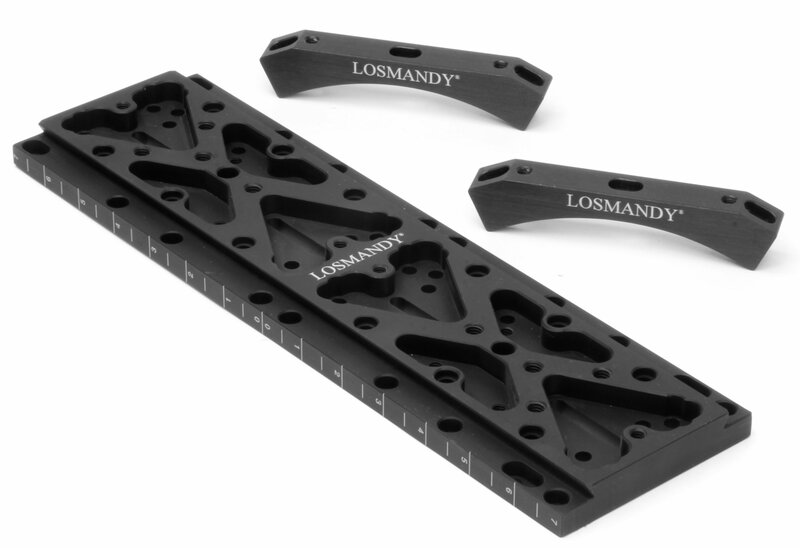 The Dovetail Plates are the heart of the Losmandy Secondary System. 0.5" x 4.0" x length of the tube assembly. 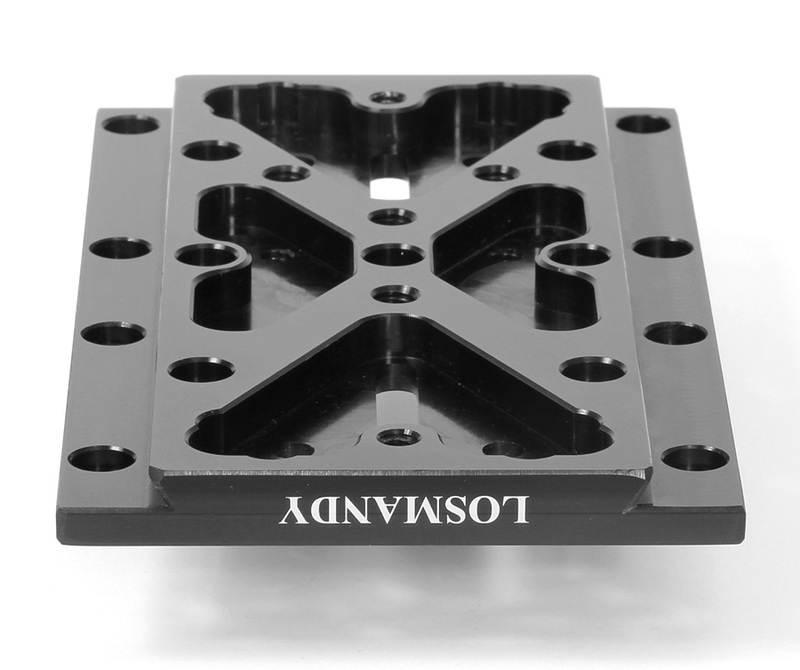 Dovetail Bars may be mounted to the top and bottom of tube assembly for mounting of all D series accessories, making it possible to use both sides of tube for equipment. 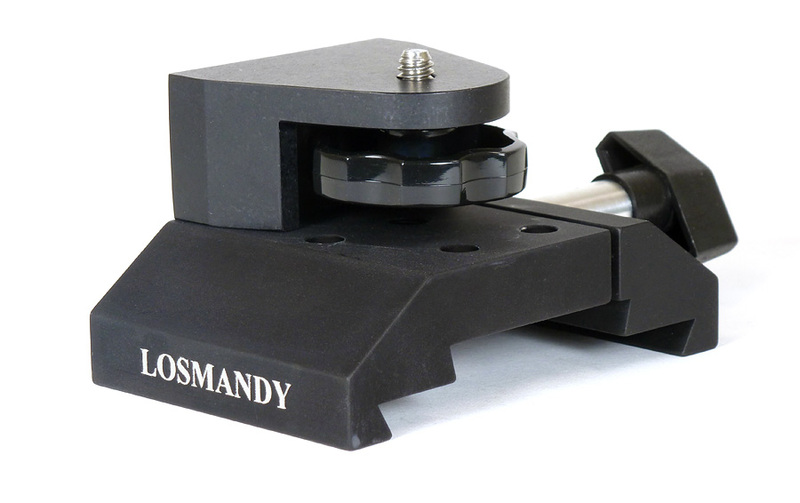 Mounts to all Astrophysics, Celestron, and Meade systems. 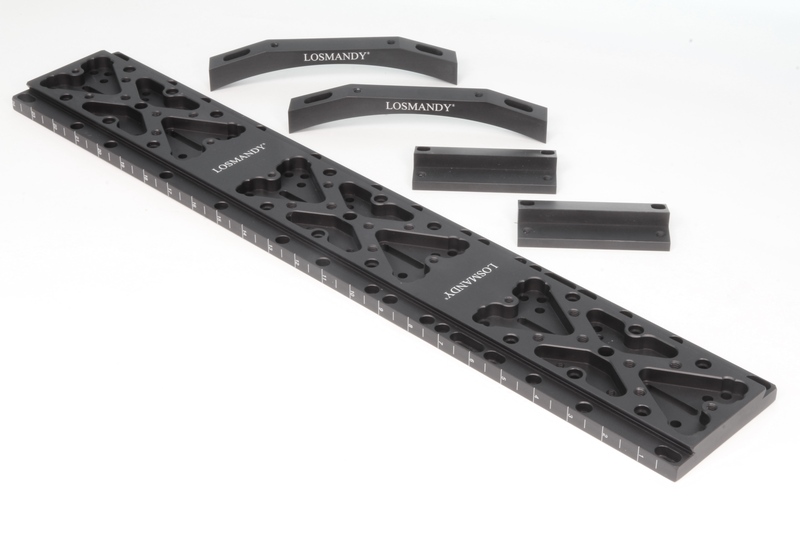 The dovetail plates, like all accessories in the Losmandy line, are machined for lightness and rigidity from aluminum stock, then black anodized for a tough, corrosion free surface. Click the Links here, or scroll down to see all products. 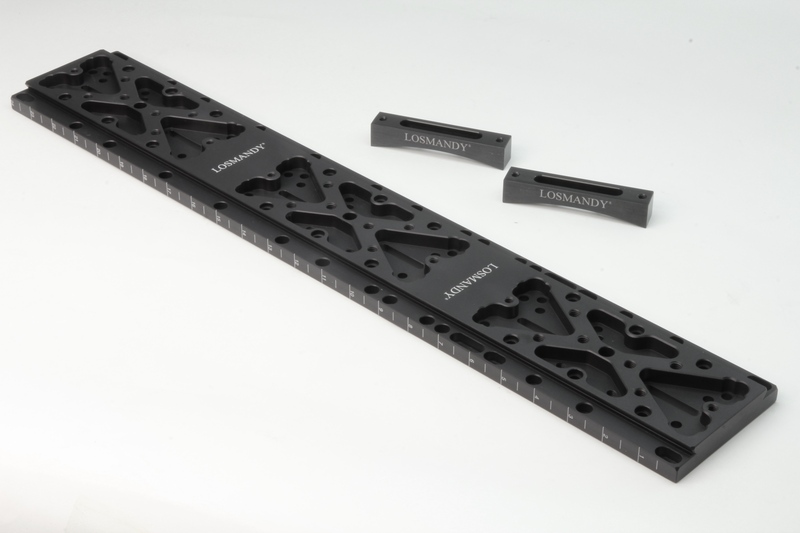 Click for larger image Now we Laser Engrave all of our D-Series and V-Series Dovetail Plates with a scale on the edge to allow quicker setup. Click for larger image Astrophysics Ring dovetail plate, DUP plate with additional screws for Astrophysics Rings. Will fit top or bottom of their rings. Wt. 2.4 lbs. Length 14", Thickness .75"
Click for larger image Celestron dovetail plate for 8", bolts to existing holes. Wt. 3.7 lbs. Length 14" HS 12.325/12.70, Ht. top of tube to top of dovetail bar 1.20" Thickness .75"
Click for larger image Celestron dovetail plate for 9.25", bolts to existing holes. Wt. 4 lbs. 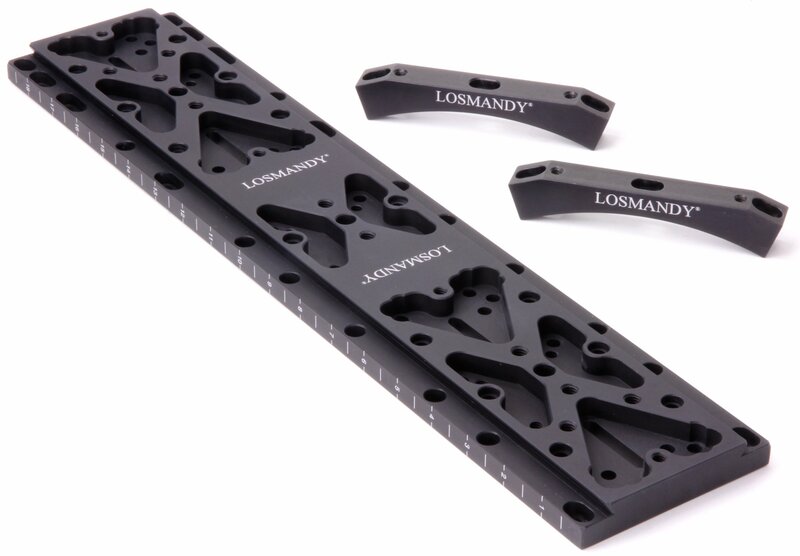 Length 19" HS 16.50 or 17.25, Ht. top of tube to top of dovetail bar 1.00" Thickness .75"
Celestron dovetail plate for 11", bolts to existing holes. Wt. 4 lbs. Length 19" HS 16.0/16.50, Ht. top of tube to top of dovetail bar 1.00" Thickness 0.75"
Click for larger image Celestron dovetail plate for 14", bolts to existing holes. Wt. 5.5 lbs. Length 24" HS 23.00, Ht. top of tube to top of dovetail bar 1.20" Thickness .75"
Meade dovetail plate for 7" Mac., bolts to existing holes. Wt. 4 lbs. Length 19" HS 16.0/16.50, Ht. top of tube to top of dovetail bar 1.00" Thickness .75"
Click for larger image Meade dovetail plate for 8", bolts to existing holes. Meade dovetail plate for 10", bolts to existing holes. 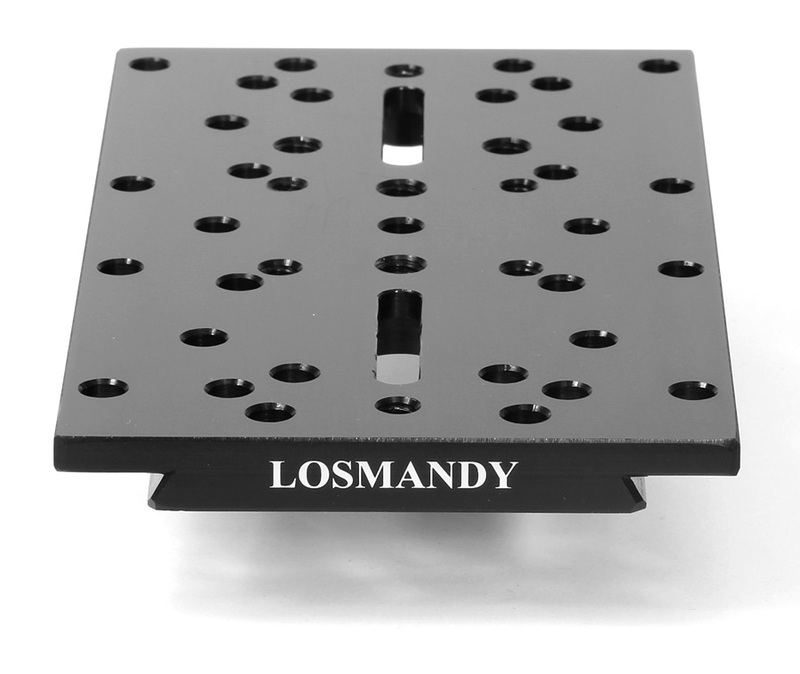 Click for larger image Meade dovetail plate for 12", bolts to existing holes. Also used for the LX850 12". Wt. 4 lbs. Length 19" HS 18.175, Ht. top of tube to top of dovetail bar 1.20" Thickness .75"
Click for larger image Meade dovetail plate for 14", bolts to existing holes. Also used for the LX850 14"
Wt. 5.5 lbs. Length 24" HS 22.00, Ht. top of tube to top of dovetail bar 1.20" Thickness .75"
Click for larger image Meade dovetail plate for 16" f8, bolts to existing holes. Wt. 5.5 lbs. Length 24" HS 23.00, Ht. top of tube to top of dovetail bar 1.45" Thickness .75"
Click for larger image Meade dovetail plate for 16" f10, bolts to existing holes. Click for Larger Image Dovetail plate adapter. Works with both D and V series plates. 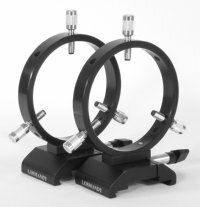 Mounts to existing rings or telescopes. For use with dovetail plate. Once mounted, no tools are needed to interchange equipment. Click for larger image Works with both D and V series plates. One axis, 360 deg. 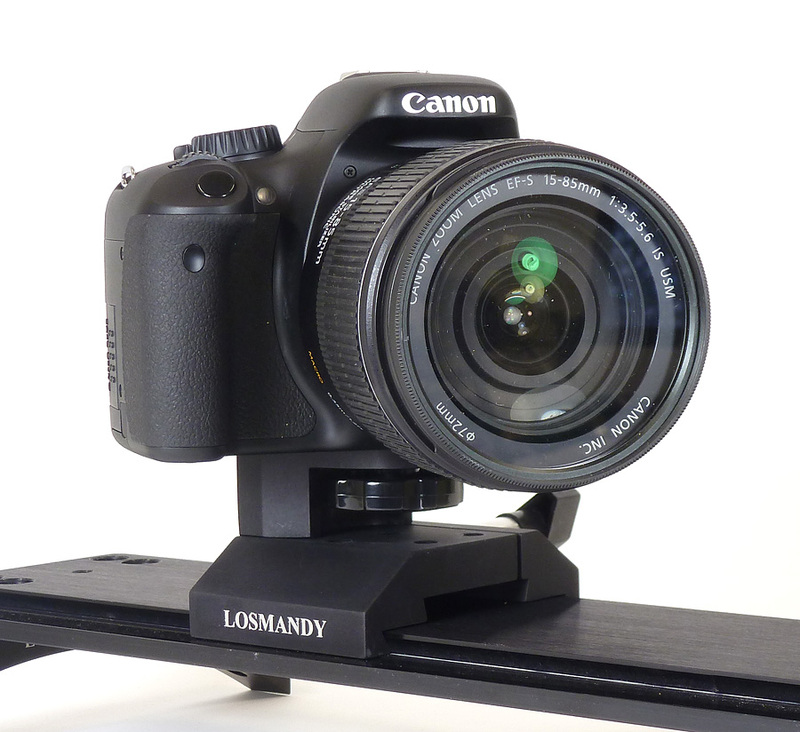 camera rotation, dovetail mounted, no tools needed. Wt. 10.75 oz. Three axis, 360 deg. camera rotation, +/- 45 deg. camera tilt, 360 deg. unit rotation, dovetail mounted, no tools needed. Wt. 2.7 lbs. 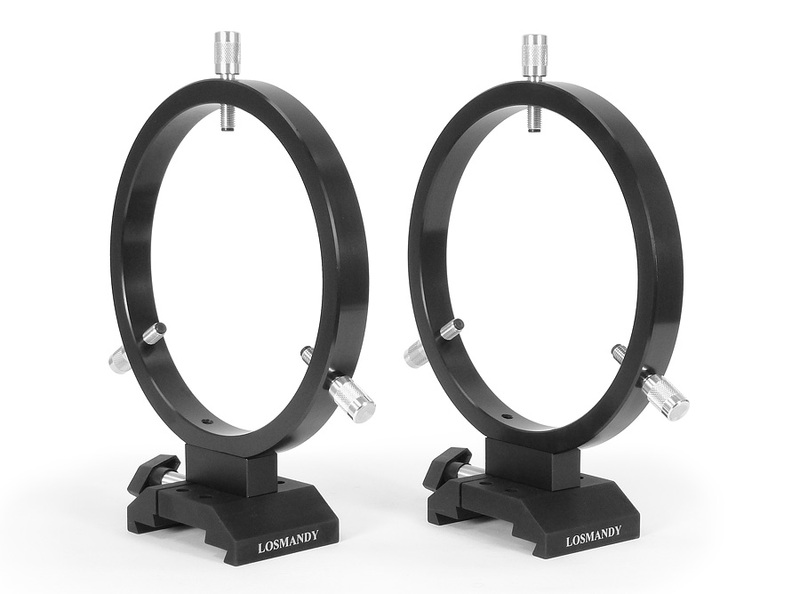 DVR108 Guide Scope Rings. 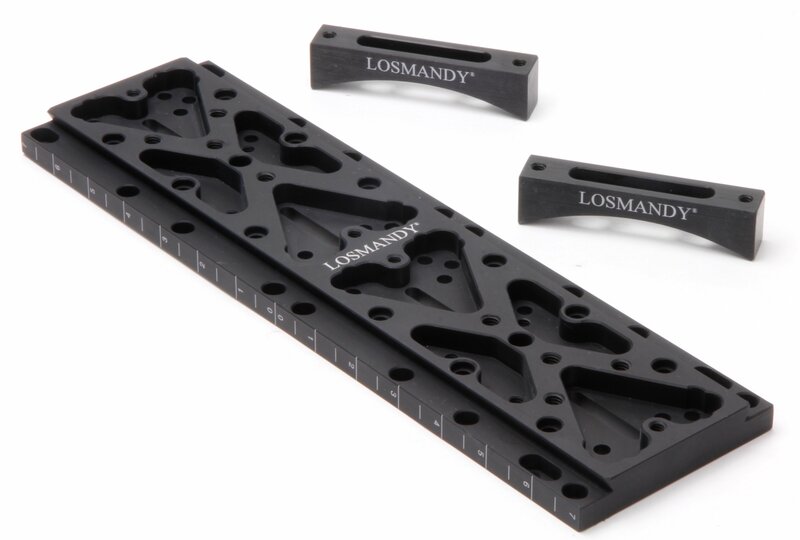 Works with both Losmandy D Style and V Series Vixen Style plates. 108mm (4.25") I.D. rings with three point adjustment. Adjustment screws made of 7075 aluminum (85% stronger then 6061), with machined 1/4" Delrin tips. Wt. 29 oz per set, 2 rings per set, dovetail mounted, no tools needed. I.D. size from 2.96" to 4.32"
DVR108/66 Three Ring AutoGuider Scope Setup. Two Rings to hold the AutoGuider Scope and one Ring to stabilize the camera/guider. DVR66 AutoGuider Camera Mounting Ring to stabilize the camera/guider. 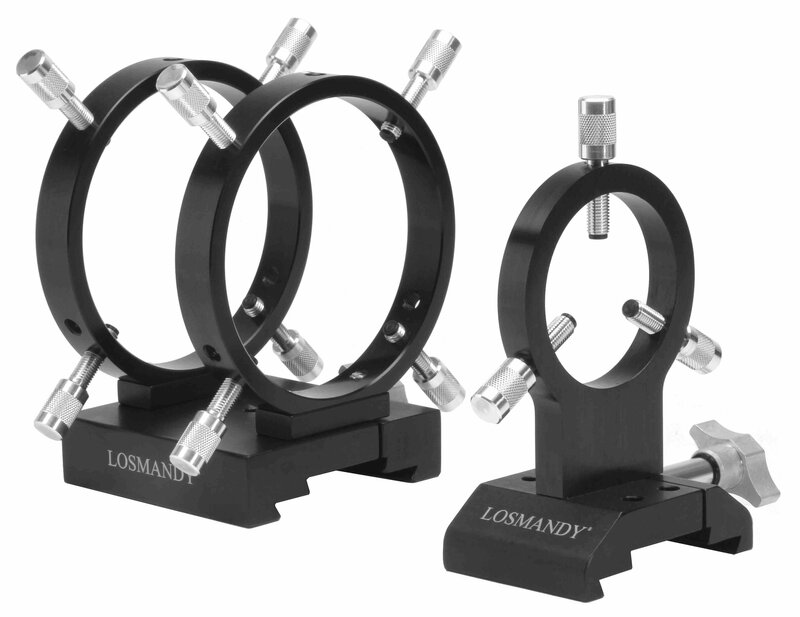 Click for Larger Image DVR160 Guide Scope Rings. 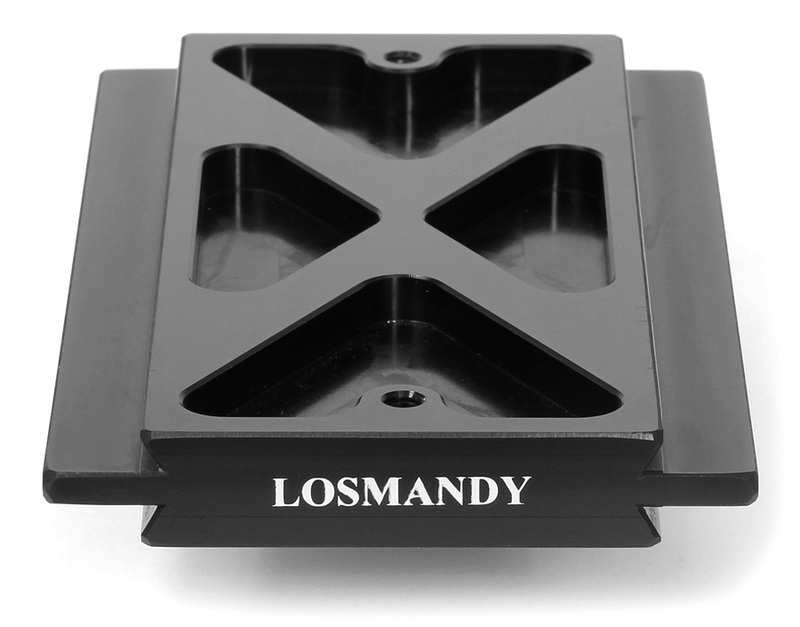 Works with both Losmandy D Style and V series Vixen Style plates. 160mm (6.3") I.D. rings with three point adjustment. Adjustment screws made of 7075 Aluminum (85% stronger then 6061), with machined 1/4" Delrin tips. Wt. 41.5 oz per set, 2 rings per set, dovetail mounted, no tools needed. I.D. 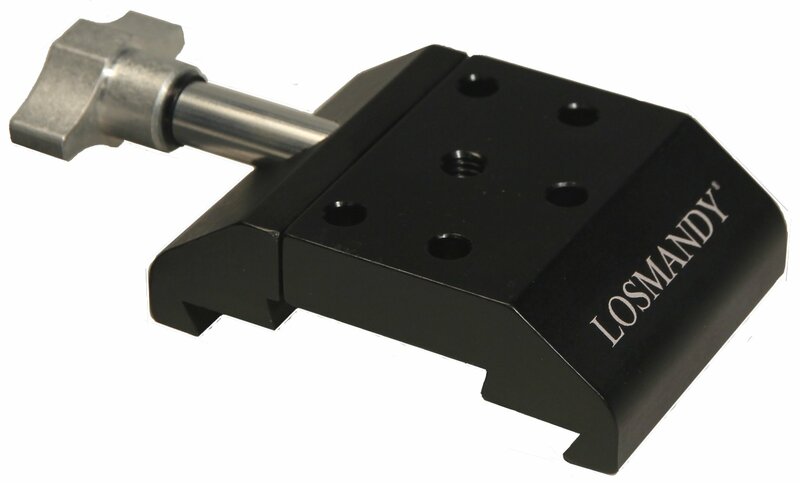 size from 5.3" to 6.3"
Dovetail adapter with a 5 inch long threaded stainless steel shaft and 2.5 lb weight. Mounts to dovetail plate, is used for the balancing of a fork mounted telescope. Wt. 3.2 lbs. total. 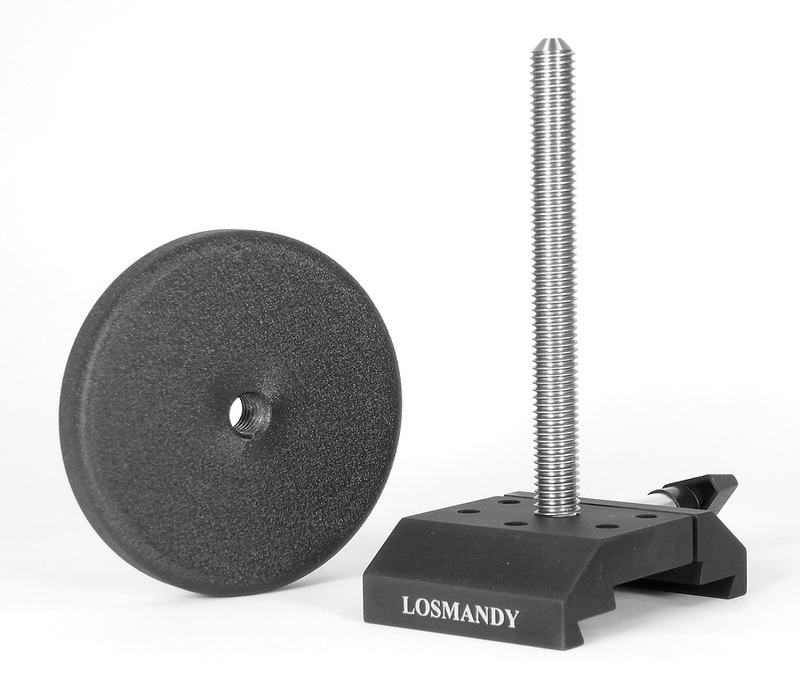 Dovetail adapter with a 2 inch long threaded stainless steel shaft and 2.5 lb weight. 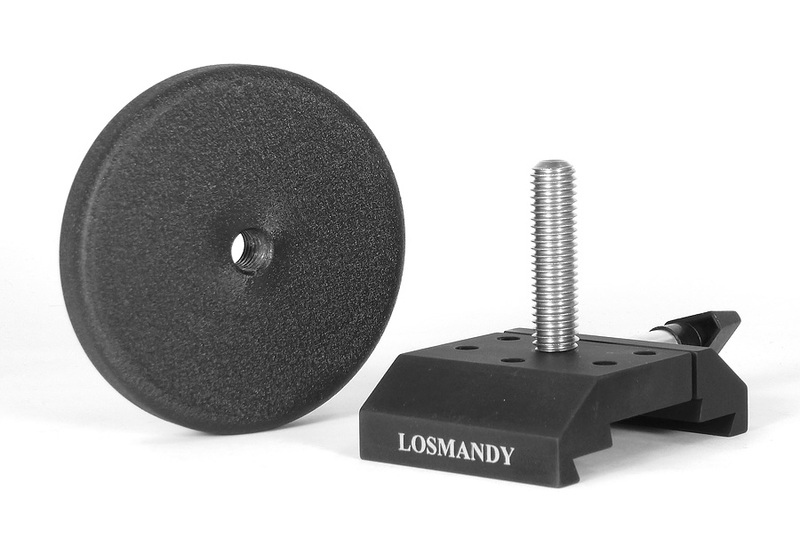 Mounts to dovetail plate for the balancing of the DEC. axis on the G-11 & HGM 200 mounts. Wt. 3.2 lbs. total. Click for Larger Image Male to male dovetail plate. 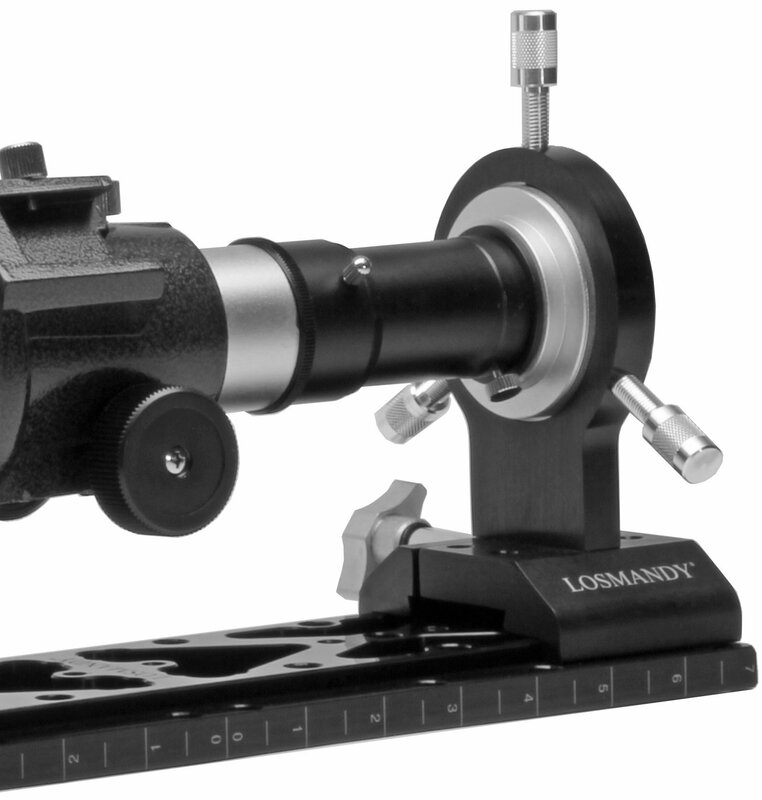 For use of secondary equipment on equatorial mount and DSBS. Wt. 1.75 lbs., Length 13.5", Thickness 0.75"
Click for Larger Image Male to male dovetail plate - short. 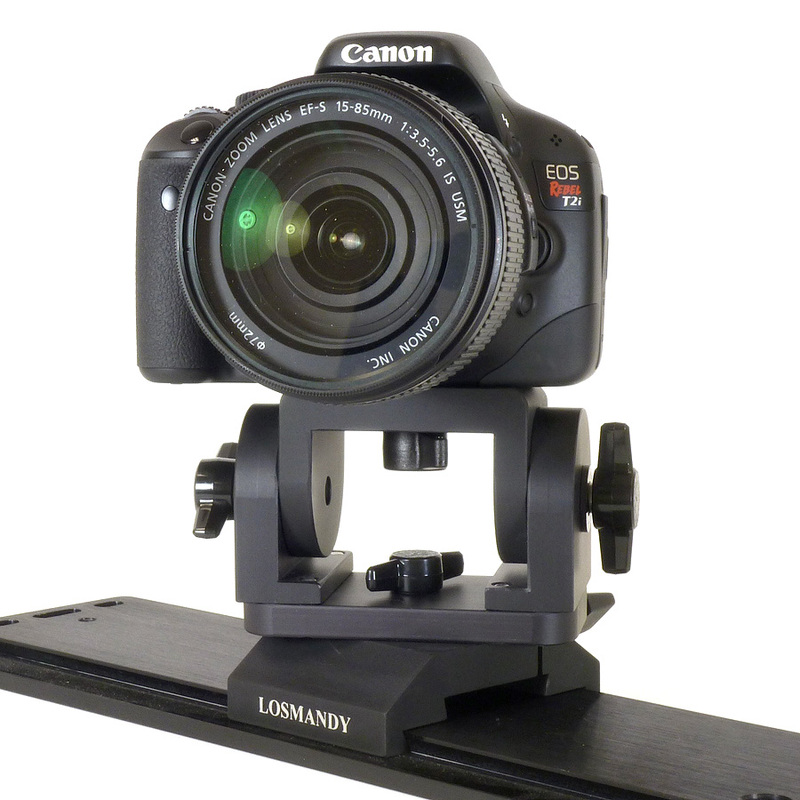 For use of secondary equipment on equatorial mount and DSBS. Wt. 13 oz., Length 7", Thickness 0.75"
Click for Larger Image Side by side plate. 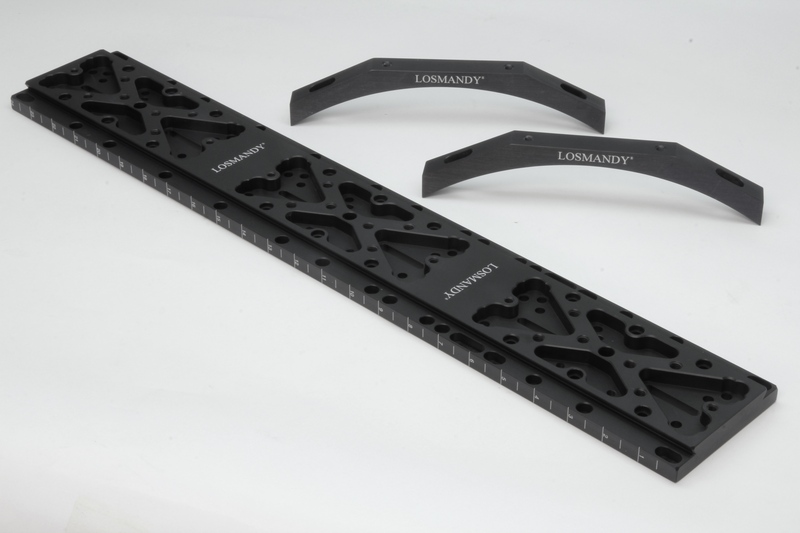 Incorporates two saddle plates mounted parallel to each other. 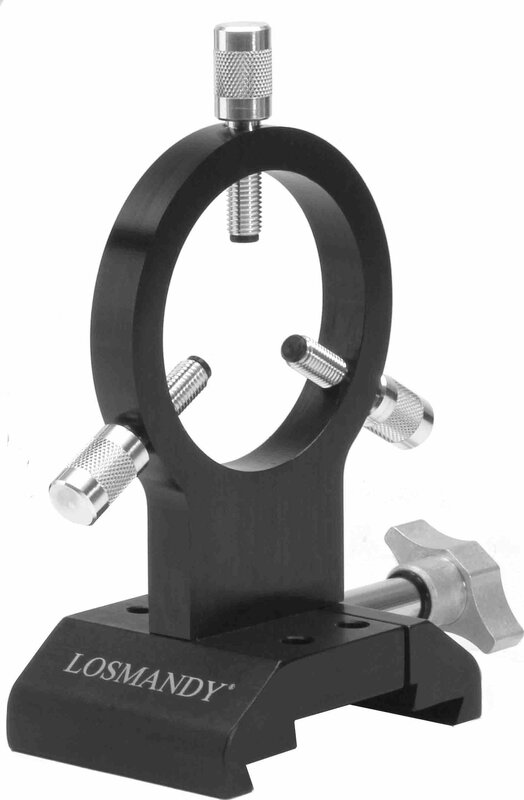 Used for mounting two optical systems side by side, by rotating the G-11 saddle 90 degrees. 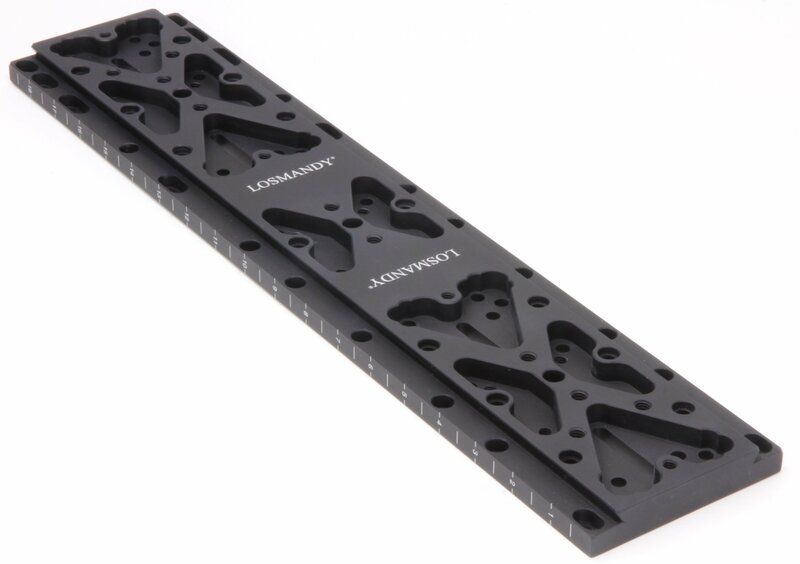 Accepts D and V series dovetail plates. Wt. 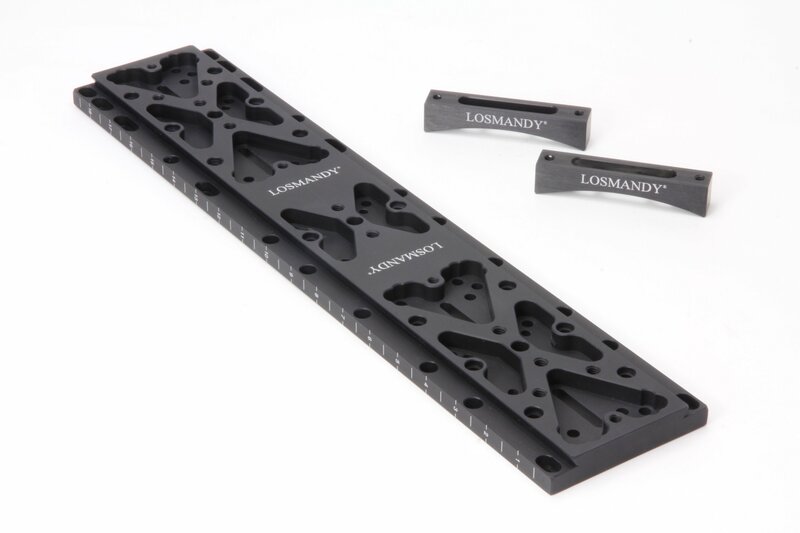 7.25 lbs., Total thickness 1.5", Saddle plate separation 10.0", center to center. 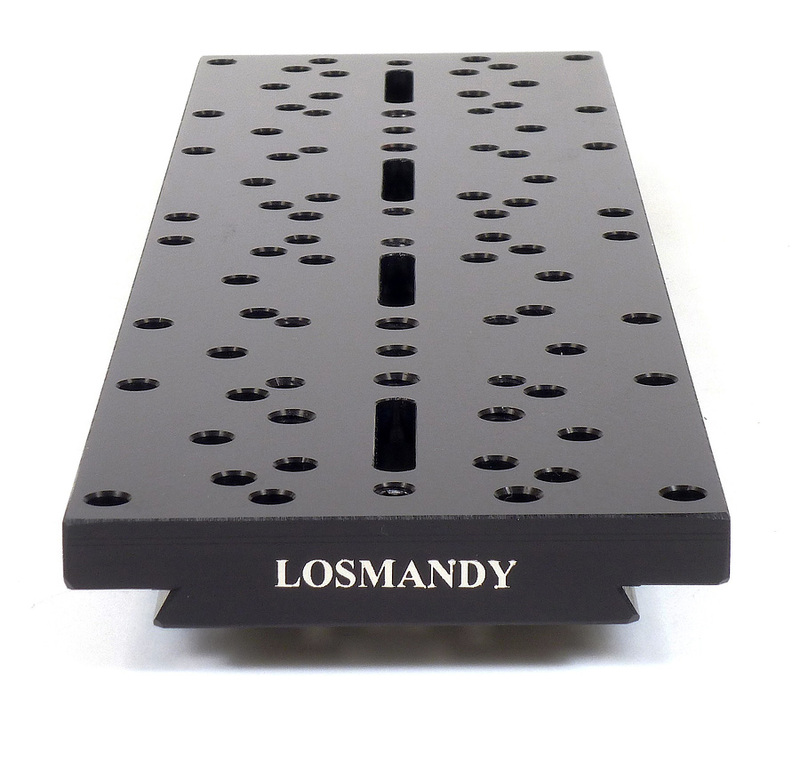 Hole Separation of 60mm, 2.00 inch, 35mm, 1.25 inch, 1.50 inch. For use on Astro Physics, Astro-Tech, Borg, Celestron, Explore Scientific, Meade, Orion, Parallax, Questar, Stellarvue, Takahashi, TeleVue, Vixen, William Optics. Wt. 2.4 lbs., Length 14", thickness 0.7"
Wt. 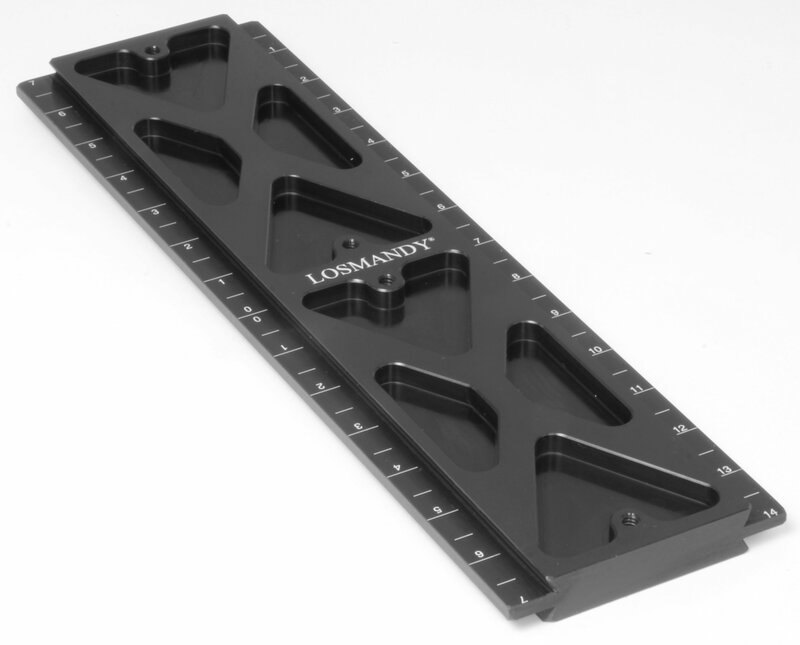 1.2 lbs., Length 7", thickness 0.7"
Fits: Meade 8, Celestron 8, Meade 7, Celestron 9.25, Meade 10, Celestron 11, Meade 12. Wt. 3.25 lbs., Length 19", thickness 0.7"
Fits: Meade 8, Celestron 8, Meade 7, Celestron 9.25, Meade 10, Celestron 11, Meade 12, Meade 14, Celestron 14. Wt. 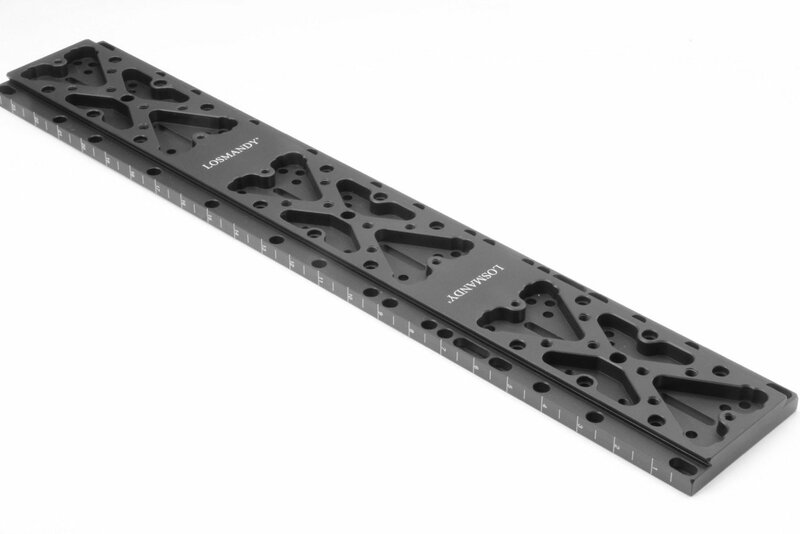 4.2 lbs., Length 24", thickness 0.7"
For More Information Contact: Hollywood General Machining, Inc.